Set the Accolade to the type of stitch you want and get started! The Accolade delivers a balanced stitch on any fabric with any type of thread. The Wave Stitch opens your world to more decorative stitches for more creativity. Try different thread colors and stitch widths to easily serge a one-of-a-kind creation. 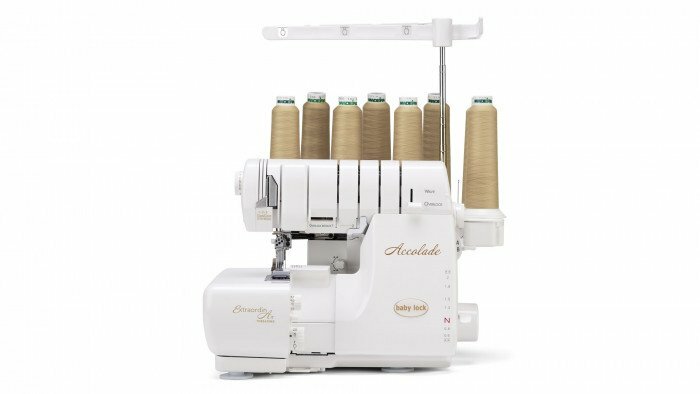 While some machines use slanted needles that push and damage fabric, the Accolade's needles are set vertically and sew directly up and down, protecting your fabric and preventing needle deflection. Functions include chain, cover, and triple cover stitches. All three cover needles are controlled by one tension dial, so you can save time with one simple adjustment.